[SatNews] Here's looking at you...Lockheed Martin Commercial Launch Services, [NYSE: LMT], announced today that it has been selected by GeoEye, Inc. (NASDAQ: GEOY) to launch the company's next-generation, high-resolution Earth-imaging satellite, GeoEye-2, on an Atlas V rocket. Financial terms are not being disclosed at this time. Lockheed Martin Commercial Launch Services is a wholly-owned subsidiary of the Lockheed Martin Corporation. GeoEye, a key provider of satellite imagery and geospatial information, announced last month winning a 10-year, $3.8-billion contract award from the National Geospatial-Intelligence Agency (NGA) for increased commercial satellite-imaging capacity. The competitively awarded contract supports the NGA’s EnhancedView program, which provides products and services that help meet the increasing geospatial needs of the intelligence community and the Department of Defense. 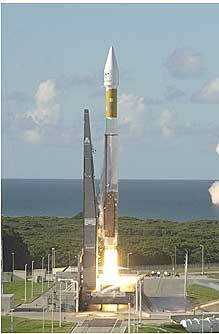 In March 2010, GeoEye selected Lockheed Martin to build the GeoEye-2 spacecraft. When operational, it will be the world’s highest resolution and most accurate commercial Earth-imaging satellite. Lockheed Martin Space Systems Company designed, built and launched the world’s first commercial, high-resolution, Earth-imaging satellite, IKONOS, which has been providing 0.82-meter ground resolution imagery to GeoEye's customers around the globe for more than a decade.